Sometimes mice get in your house. When they do, they can contaminate food, chew through just about anything and also freak out some family members. Once mice are in the house, DIY efforts to get rid of them can be a long & frustrating experience. So, how about just keeping them outside in the first place? Don’t Delay – it is much easier to keep mice out of your house than get rid of them once they are in. Mice multiply very fast. 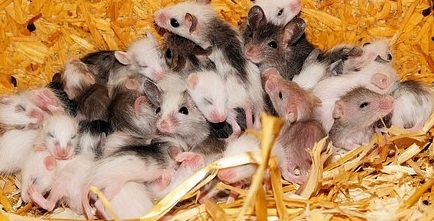 To put it into perspective, a family of 6 mice can multiply into 50 – 60 mice in just 90 days. 2-Pronged Approach – When trying to keep mice out of your house, you need do everything you can to eliminate of their comfy living conditions and also make it hard for them to get inside. Elimination of ‘Harborage’ Locations – Harborage locations are where mice live and build their nests. Clutter makes a very safe harborage area for mice. They do not want to be out in the open so, if you have a lot of boxes or other items stored in a basement or attic, that provided cover for the mice. Anything you can do to eliminate this condition will make your home less desirable to mice. Exclusion – Exclusion is taking steps to make it hard or impossible for mice to get into a building. Eliminating harborage areas includes removing or altering areas where mice live and have their nests. Put on your detective hat & inspect the exterior of your house closely. Look high & low. Look for small openings as well as larger ones. Mice can squeeze through a gap the size of a dime so be sure to inspect closely and address any of the exclusion items below. Openings where utilities enter your house such as electrical lines, water pipes, dryer vents and hose bibs. Fill gaps and openings with copper mesh. Mice can chew through caulking but not copper mesh. Gaps along the bottom & sides of garage doors. Weather seals wear out and need to be replaced every few years. Also check the seals around the door edges. Gaps under entry doors. Install rodent door sweeps. Rodent door sweeps have a special interior fiber that rodents cannot chew through. Traditional brush and rubber door sweeps do not deter rodents from chewing and passing through the sweep. Open vents. Remember to look up. Tall grass or other vegetation along the foundation of your house is an ideal environment for mice. Keeping a three foot wide space between any vegetation and your house is a good practice. Green Giant provides Vegetation Management services including Weed Control in Planting Beds. Look for voids under concrete slabs such as sidewalks and steps. Eliminate unnecessary debris. Mice like to tunnel under pieces of wood or other materials. To Stay Warm: Mice will start coming inside in the early fall when it starts to get cold. Mice will often go back & forth from inside to outside during the cold months. If we get a warm spell, the mice will venture out– then come back when it gets cold again. To Find Food: When it gets cold the food supply for mice decreases they will try to get inside a nice warm house to find food. To search for nesting locations: Hey, it’s a tough world out there – might as well come inside! By addressing these issues, you will greatly increase your chances of denying entry to mice! If you are interested in hearing more about Rodent Control services or any of Green Giant’s services, please contact us!